Plein air painting, sidelined to some degree due to demand for abstract modern art, has experienced a nationwide resurgence during the past 20 years, said Bruce Bondy, Friends of the Chicago River fundraising volunteer. Much like impressionism, the form represents an immediate response to a visual situation and is most popular in rural areas, Bondy said. Chicago, with its river juxtaposed among sky-high architectural works and chaotic city traffic, is an exception. Friends of the Chicago River has a hand in nearly everything involving the now-beloved waterway, from launching educational programs in schools and sponsoring river cleanups to promoting wildlife research and opposing a plan for a Navy Pier aerial tram, which critics say would crowd the Chicago Riverwalk and detract from the aesthetic experience. As with any non-profit, those activities require funding. Friends of the Chicago River in 2017 generated $1.4 million in revenue from individual, corporation, foundation and in-kind contributions, but incurred expenses totaling almost $1.3 million, according to the organization’s annual report. More than $1 million — 80 percent of the costs — went toward its various programs. That’s where PAPC members saw an opportunity to help, Bondy said. After a few hours of work, the artists framed their paintings for display and sale outside the McCormick Bridgehouse & Chicago River Museum, located on the Riverwalk below the Michigan Avenue and Wacker Drive intersection. The paintings ranged in price from $100 to $800. Bondy said 25 percent of sales revenue would support Friends of the Chicago River, although he couldn’t estimate a final figure. However, sales proceeds weren’t the only benefit. By the time the paintings were dried and displayed, riverside traffic had shifted from daytime runners to tourist groups. Coles said he hoped the works would create interest in the museum, where admission costs $6. “The more people that are exposed to an exhibit that we have inside, which tells the story of the river, the more people will understand why this is so important to the city,” he said. And if the past is any indication, the Chicago River will continue to be a favorite artistic subject — and source of pride — for PAPC members, Longe said. 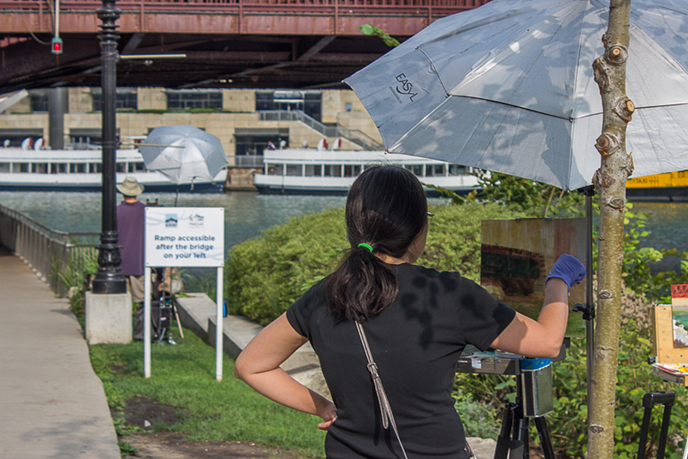 “The Plein Air Painters have painted as far north as the Skokie Lagoons,” Longe said. “We’ve painted at North Avenue. We’ve painted at Canal Street. We find locations that show the river, work with the river.